OK, it may be the shortest element of most triathlons, but a good swim is critical for getting your race off on the right foot and decreasing the pressure you may feel later in the race. When energy levels are flagging during the run, it’s far better to have a cushion gained in the early stages than needing to make up ground. A good quality wetsuit can help you cut through the water, can ease your time through the transition to the bike, and provide that critical confidence boost as you start your ride. There are a myriad of wetsuits out there at all sorts of price ranges, even nudging into the thousands in the example of some ROKA suits. Here we have picked out four of the best. Excellent choice for those whose swim technique is not as strong as they’d like. Incredible buoyancy while retaining flexibility of movement. Comes with a 2-year warranty but isn’t cheap at approximately £380. For beginners or less experienced triathletes, this would probably be my pick. It is comfortably the most forgiving wetsuit we tested, offering really good buoyancy and stability in the water – yet remaining extremely flexible. This is achieved via several panels across the suit including 5mm thick neoprene in the legs and lower back and 1.5mm neoprene in the arms. The position in the water is really comfortable and movement felt really free. If your swimming technique is a little lacking right now, this suit could really make the difference in improving your finishing position. What’s more, it comes with a 2-year warranty for peace of mind, so I have no hesitation in recommending this suit. At the £380 mark it’s not cheap, but would be a worthy investment. Really good buoyancy and stability. Not cheap at around £380. Brilliant spec for what is an entry level suit at the price point (around £170). Extra thickness in the legs provides a rock solid swim and good buoyancy in the water. Strong eco-credentials as it is made with recycled tyre rubber. The price point of this suit (around the £170 mark) makes it an entry level wetsuit, but more experienced triathletes shouldn’t let that put them off. This is a really strong product for the price. Like the P:2 shown above, this also features extra thickness around the legs, providing stability and buoyancy in the water – although the 4mm neoprene featured here is not quite as thick as the 5mm of the P:2. The suit is really well fitted and the leg and cuff panels really help speed up transition. Interestingly, the Zone3 is made from recycled tyre rubber so it has strong eco-credentials if that is important to you (which it is for many of my triathlete friends). 4mm of neoprene thickness in the legs for buoyancy and stability. Good all-rounder but more experienced triathletes may benefit from spending a little more. A brilliant wetsuit for the money (just over £100) that gives a nice swim position and terrific freedom of movement. Colder waters may be a challenge as this suit is thin, so those competing in the autumn and winter months may want to look elsewhere, but hard to find fault at this price. This suit retails at £125 RRP and it is absolutely astonishing how good a suit Speedo have created here for the cost. The fuse neck does a great job of keeping water out and body position regulators on the thighs give a welcome aid to the swimming position. The legs have buoyancy panels to help lift the lower half, and the 1.5mm thickness in the chest and arms provide plenty of freedom of movement. The downside (and there had to be a downside at this price) is that the suit is fairly thin overall, and if you are in sub-10 degree water you are certainly going to feel it! But let’s not let that detract from what is an otherwise remarkable wetsuit for the cash! Good freedom of movement and a nice swim position. Thin, so perhaps not suitable for colder swims. A really good wetsuit that many swear by. 3mm of neoprene provides good warmth and added stability in the water, but at around the £380 mark is potentially a bit too expensive for my liking. 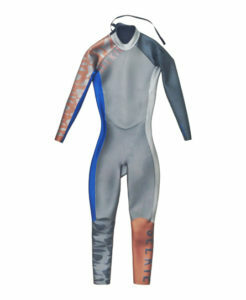 This suit from Selkie has a standard 3mm of neoprene around the chest and legs, and this gives added warmth and a good level of stability in the water. Around the arms and shoulders this drops to 2mm for that much needed swim freedom. Out of the water it is nice and easy to adjust so makes for a seamless passage through transition, and the design is pleasingly different. But at around £380 it feels a bit expensive. This is the same price point as the 2XU P:2 Propel featured at the top of this article, and if pushed I’d plump for that suit over this Selkie. But there are plenty that swear by this wetsuit so it’s definitely worth your attention. 3mm neoprene gives good levels of warmth and stability in the water. Easily adjusted out of the water and excellent through transition. Possibly a bit too expensive at ~£380. Hopefully you found this article useful and have found your next wetsuit. Any comments or suggestions, please feel free to drop us a note in the comments section below.